!! OMG, she’s lost control (of bidding): Joy Division’s Ian Curtis’ kitchen table for sale on EBAY !! May the 18th 1980 Ian Curtis the singer of Joy Division took his own life in the Kitchen of the house he lived in with his wife Debbie at 77 Barton Street. Debbie Curtis then sold the house and many of its contents to a neighbour Dorothy Smith who then ran it as a B and B. In 1996 the table was passed to Dorothy’s Daughter Vicky Morgan when she got married and set up home in Macclesfield. In December 2005 the Morgan’s were redecorating and felt that the table no longer fitted in with their own home. 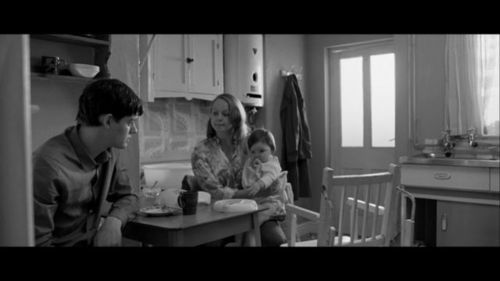 They offered the table back to the family and contacted them via Marco of Joy Division Central. Control then went on general release and the Legend Grew. Included with the Table are confirmation of authenticity from Natalie Curtis, Debbie Curtis, Marco from Joy Division Central and Vicky Morgan. Also there is a four page print from a web site with pics taken inside 77 Barton Street when it was a B and B and a picture of Dorothy Smith. Hmmm, kind of macabre considering Ian took his own life just a few feet away from the thing, but I guess if you’re a fan then that may be something you could look past? Find the official listing for Curtis‘ table HERE. Be the first to comment on "OMG, she’s lost control (of bidding): Joy Division’s Ian Curtis’ kitchen table for sale on EBAY"